Dr. Kore K. Liow, middle, surrounded by the Hawaii Pacific Neuroscience team. Hawaii Pacific Neuroscience (HPN) opened its second 20-clinic room location with a dedicated research & clinical trial unit on the St. Francis Liliha campus in March. This new location is enabling Hawaii’s leading multi-specialty neuroscience team, led by Kore Kai Liow, M.D., to expand the practice, grow its specialty areas and serve more patients. In 2014, HPN served more than 24,000 neuroscience patient visits from all islands. The new office, following extensive renovations to the Sullivan Building, occupies 4,500 square feet of space in Suite 104 on the first floor, a part of the St. Francis Liliha campus transformation. The Sullivan Building is also home to Hawaii Diagnostic Radiology Services, Leslie’s Gift Shop, both on the first floor, and the 119-bed Clarence T.C. Ching Villas on the third, fourth and fifth floors. “We are blessed to be part of the exciting developments at the St Francis Liliha campus and feel honored to play a small part in the overall vision being developed here to continue the legacy of caring for our state,” said Dr. Liow, Director of Hawaii Pacific Neuroscience, who is also a clinical professor of neurology at the University of Hawaii John A. Burns School of Medicine. “Our one of its kind, fully integrated neuroscience team is committed to improving one life at a time.” The neuroscience team is composed of neurologists (adult and pediatric), geriatrician, physiatrist, neuropsychologists, psychologist, and researchers. Hawaii Pacific Neuroscience patients have access to an array of specialized, disease-specific centers, ranging from Centers for healthy aging and memory, Parkinson’s, movement disorders and neurodegenerative diseases, behavioral health, headache and facial pain, geriatric medicine, stroke and neurologic restoration, epilepsy, neuromuscular disorders, and brain science research, to pediatric neurology. Each center incorporates an interdisciplinary approach to the diagnosis and management of a specific neuroscience condition, leveraging on the expertise of different specialists to deliver the best care for those with complex neurological conditions. Hawaii Pacific Neuroscience is committed to giving back to the community. In 2014, it served as a teaching site for more than 30 residents, medical students, and graduate and research students from around the state. The practice leads the state in bringing the latest neuroscience research treatments and clinical trials to the islands. Patients with memory loss, movement disorders, epilepsy, stroke and other neurologic conditions may call the research hotline at 808-564-6121 for more information. HPN prides itself with a focus on providing holistic patient care. “We believe care should also include preventive measures, wellness and healing for both mind and body,” added Dr. Liow. Hawaii Pacific Neuroscience opened its first location at Castle Medical Center in 2009 and has grown to be one of the largest neuroscience practices in the state. For more information, call 808-261-4476 or visitwww.hawaiineuroscience.com. Gordon Bruce, Pacxa chairman and CEO, and Tyler Tokioka, Island Insurance Foundation president, present a symbolic check of $25,000 to Sister William Marie Eleniki, St. Francis of Healthcare Foundation president, and Jerry Correa, St. Francis Healthcare System of Hawaii president and CEO. 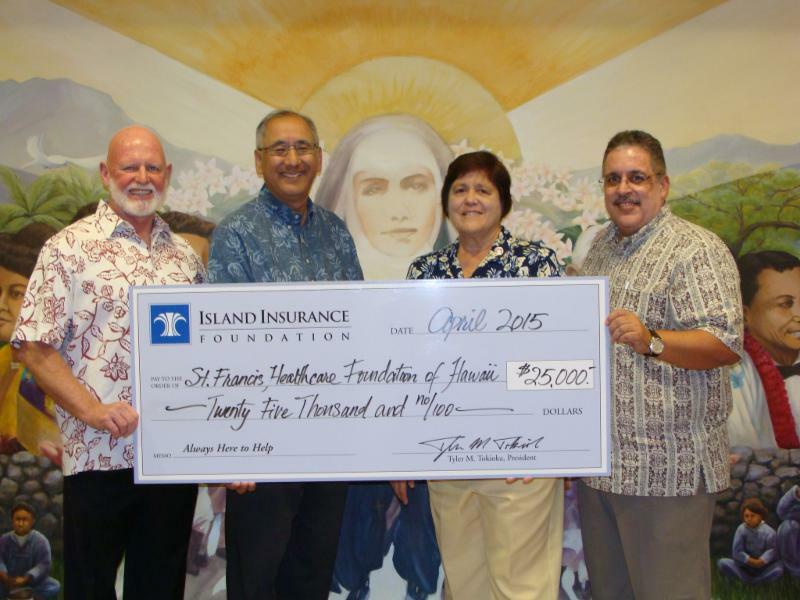 Mahalo to Island Insurance Foundation for its generous gift of $25,000 in support of the capital campaign to transform the St. Francis Liliha campus into a comprehensive, one-stop health and wellness community. The community, specializing in the care of Hawaii’s growing elder population, will be known as the St. Francis Kupuna Village and includes the completed 119-bed Clarence T.C. Ching Villas in the Sullivan Building. Pacxa, an Island Holdings subsidiary, was responsible for building the information technology infrastructure for the entire Sullivan Building. The Island Insurance Foundation was established as the charitable arm of Island Insurance, Hawaii’s largest locally-owned and managed insurer, offering a full range of property and casualty protection.